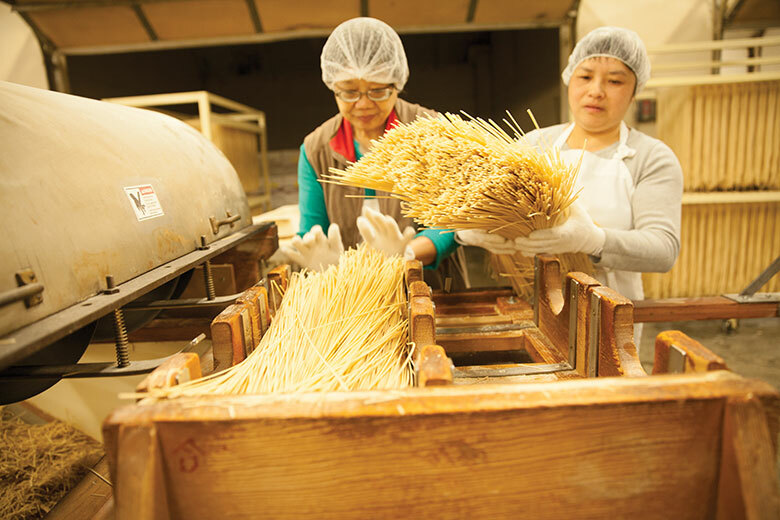 For a century, a Chinatown/International District manufacturer has been turning out a singular product that feeds the community and fuels the multi-generational family business. The 100-year-old last remnant of the Chinatown/International District’s once-thriving food manufacturing industry, a thin layer of flour coats every surface and a heavenly cookie scent wafts through the air. Ribbons of dough stack up hypnotically on machines that stretch the length of the room and transform raw ingredients into 17 different kinds of noodles and one special cookie. Local children often visit “the fortune cookie factory” on school field trips, but the cookies are only a small part of Tsue Chong’s offerings. The noodles—all based on an original recipe of flour, salt, water and eggs—are the big business. Ratios get tweaked, sizes vary, and noodles are sold fresh, dried, steamed or boiled, but they all start from the same four simple ingredients, just as they did 100 years ago. The process today is a bit more mechanized, the factory is around the corner from the original location (now the retail business) and the cookies are a newer addition, but the original noodle recipe and the family remain the same. 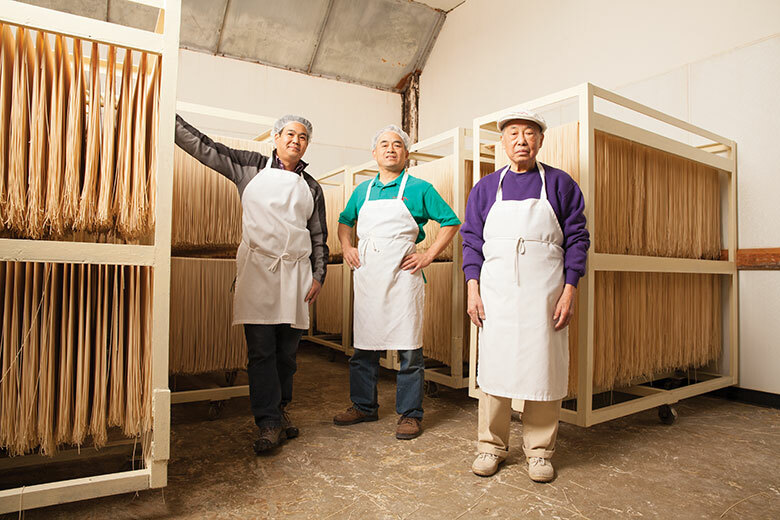 Noodles, owner Tim Louie explains, “are a recession-proof business.” Four ingredients, one central product and 100 years of feeding the community. Hong Kong-style steamed noodles are one of 17 types of noodles produced at the factory. In 1898, Tim’s great-grandfather, Gar Hip Louie, an emigrant from Taishan, China, noticed that while Seattle had plenty of other general laborers like himself, nobody was making noodles. For seven years, he made the noodles by hand, wrapped them in newspaper, and sold them to local restaurants and shops. In 1934, his son, Fat Yuen Louie, took over. Fat Yuen’s grandson, Tim, now owns the factory, and he tells the story of his family’s business from his office, just a few feet off the floor where machines crank out 10,000 pounds of noodle products each day in the three-story, 38,000-square-foot factory. On the first floor, lofted mixers at one end of the factory floor churn the ingredients to the texture of Play-Doh, dropping the dough into compound rollers that begin the flattening process. A series of sheeters rolls it thin as the dough makes its way down the row of machines, before it is cut to size, and the dumpling wrappers, fresh noodles or spring-roll squares are loaded onto carts for packaging. Upstairs on the third floor, some of Tsue Chong’s staff of about 30 prepare the more labor-intensive noodles (and the fortune cookies): Rice flour noodles steam, ramen noodles cook, and dried noodles are cut to size using a marvelous old wood and metal contraption built by Fat Yuen. The second floor is storage: newly arrived ingredients awaiting their noodle destiny, packaged noodles waiting to get shipped out to Tsue Chong’s many customers. From the smallest customers—local restaurants—right up to the Sysco and Food Services of America giants, Tim brags about all of his clients, and tries to eat a meal at as many of their restaurants as he can. “I never let my kids knock chop suey restaurants,” he says of the hole-in-the-wall Chinese-American restaurants that have fallen out of favor with the rise of restaurants serving more authentic Chinese food. “That is how we got our start: places in Boise, Spokane, around the Northwest." Tim grew up in a multigenerational home nearby, with his grandparents Eng Shee and Fat Yuen, while spending time at their feet in the family noodle factory. Recently, Tsue Chong’s longest-employed worker retired—he’d been there since the ’60s and remembered Tim running around in diapers. Tim’s grandparents retired when he was in kindergarten, and his father, Henry, quit his job at Boeing to run the factory with his brother, Kenneth, in the 1950s. By the time he was in high school, Tim was already involved with the family business, negotiating to get his driver’s license early to make the deliveries. But still, at that point, it was just a job. He headed to college, planning to be an engineer, but after two years, realized that his family’s business was still viable. Since he still worked summers there, he knew it well. He switched his major to business and after graduating, came to the factory full-time. He helped the company make the transition to its current location in the ’80s, just around the corner from the original spot. 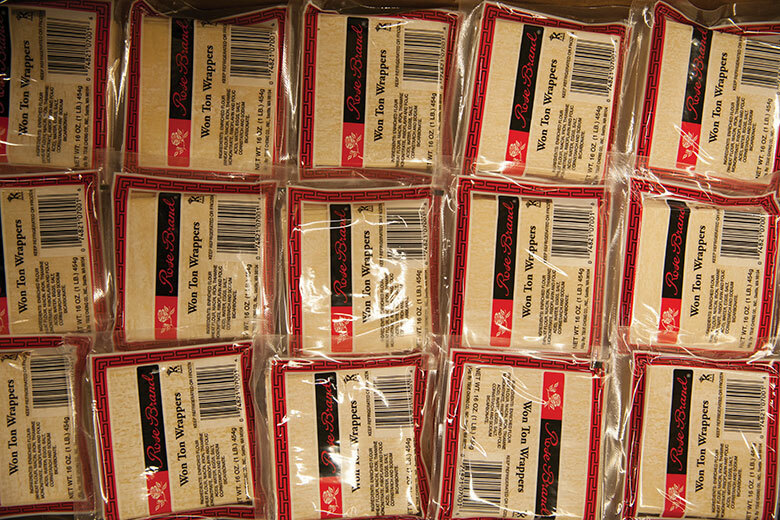 Big sheets of the wrappers are cut to size before being packaged. “All of our workers live here or nearby; we like being in the Chinese community,” Tim explains. But he knows the city is changing, and manufacturing businesses are being pushed out—his is the only one left. One of the new streetcar lines blocks where they used to park trucks. “Big city growth means big city challenges,” he recognizes. He admits that, at some point, Tsue Chong will likely need to relocate, to SoDo or South Seattle. But that frustrates the guy whose wife jokes that they can’t eat in Chinatown because too many people stop Tim to chat. This community, where his employees live, eat and work, has hosted Tsue Chong for a century, from Gar Hip’s first noodle to Tim’s memories of his grandmother folding fortune cookies, and Tim remains hopeful he can find a way to stay here, even as he watches the neighborhood change around him. 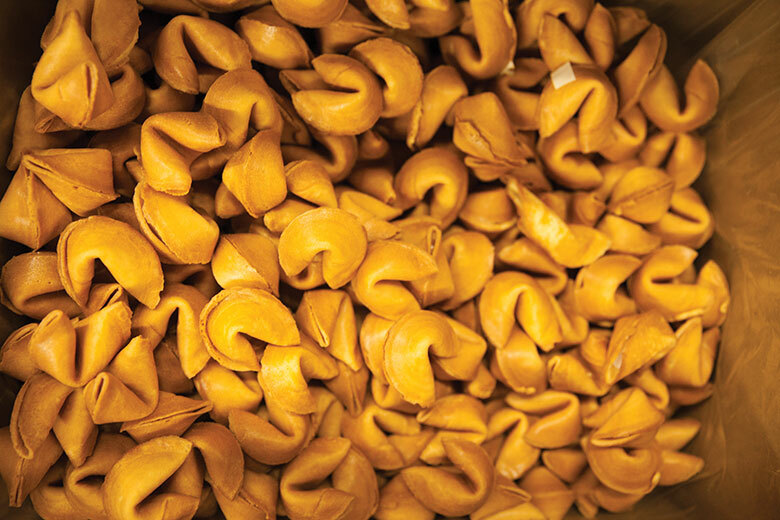 In 1917, when Gar Hip Louie started making noodles, the fortune cookie—now a symbol of Chinese food in America—had yet to be invented. But by the mid-’50s, Eng Shee and her son Kenneth noticed their growing popularity and saw an opportunity for the noodle factory to branch out. The factory still uses her same recipe (pastry flour, cane sugar, vanilla, whole eggs, water and coconut oil), but has since moved on from folding each cookie by hand to doing it by machine. Once the dough is ready, each cookie takes a four-minute journey through the machine, which presses it out a flat circle, inserts one of 500 fortunes, then folds it up before spitting it back out. Back when Eng Shee folded them by hand, she could fold 13 cookies per minute. Today, the machine makes more than 10 times that: 8,000 each hour. It also makes fewer mistakes, which means that they keep running out of the “rejected fortune cookie” shards sold in the retail shop next door. But by the time the fancy machines came in, the bags of rejects were so popular that Tsue Chong had to keep making them. Today, one of the older machines runs solely to make the broken pieces sold as rejects.